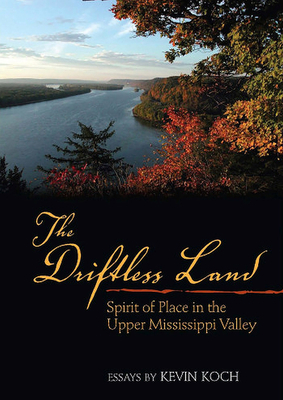 The Driftless Land, a collection of essays by Kevin Koch, is a search for the spirit of place among the bluffs, woodlands, and prairies of the Upper Mississippi River valley. The Midwest is commonly known for its flatlands, for oceans of corn pressing towards the horizon beneath a big sky. Lesser known are the steep hills and bluffs, the ravines and towering rock outcroppings where the upper Mississippi carves its meandering path. These rugged lands amid the prairies are known as The Driftless Area, a 20,000 square-mile region of northeast Iowa, northwest Illinois, southeast Minnesota, and southwest and central Wisconsin, bypassed by most of the glaciers. Koch observes, “You can ‘love nature’ and ‘love the land’—but you won’t know place until you’ve walked slowly and attentively through Lost Canyon or the Kickapoo Valley Reserve or Swiss Valley or Trempealeau Mountain, and then returned to learn what you can about them.” Hidden within the woodlands are the imprints of human history and the deeper geological story as well, the story of a land untouched by the ancient onslaught of leveling glaciers. The result is a call to know place deeply, whatever place you inhabit. Kevin Koch is a Professor of English at Loras College in Dubuque, Iowa, where he teaches courses in creative non-fiction and nature writing. A native of Dubuque, he loves to hike, bicycle, cross-country ski, and snowshoe amid the hills and bluffs along the Mississippi River, and to canoe its backwaters. Koch is also the author of Skiing at Midnight: A Nature Journal from Dubuque County, Iowa, and editor/compiler of Rising with Christ: Catholic Women’s Voices Across the World.